With update 18 comes the much requested female player character, the framework for major performance optimization and much more. When starting a new game you can now choose between either a male or a female character. After choosing the gender of your character you can now choose which region of the world to start in: The Frozen North, The Jungle Mountains, The Southern Shore or The Island. Each region has multiple random starting points within. Dozens of Points of Interest (POI) are now pre-marked on the map as a white dot. These mostly include villages, major landmarks and the Dragon Keeps. The POI marker will turn yellow after it has been discovered and you will gain a substantial amount of experience points. New building pieces have been added: A triangle wood floor foundation, a triangle shaped roof section for wood huts that corresponds with angles made with the triangle wood floor and a complete roof cap section that can be placed on top of a “round” hexagon hut made with 6 triangle foundations. The triangle foundations can be used in conjunction with the square foundations to create as big or as large of a circular foundation as you please. Explore the newly added villages for examples and building ideas for your own designs. This only applies to the wood hut constructions for now in the warmer climates. Triangle foundations will be added to the stone huts in the cold climates in the future. 2 times more wildlife spawns have been added to the map. With this change is also an optimization that unloads individual wildlife from the game when you are very far away from them. Previously the wildlife would be “deactivated” when far away, but unloading them completely greatly increases performance once hundreds of creatures have been loaded into the game. Visit the desert to find a new oasis and a Great Pyramid filled with labyrinthine tunnels and treasure. This Pyramid is similar to the one on the floating island, but you don’t have to have a dragon to reach it. 2 animated Non Player Characters, (NPCs) have been added to a large hut in the center of the Jungle Mountains area. They cannot yet be interacted with, but the framework for NPC interactions is being worked on. They will offer quests and story lore in the future. When you have gauntlets equipped, they will now appear on your forearms in first-person view while wielding the Maul and Axe that was added in Update 17. A Stone Wall crafting recipe has been fixed. It previously needed wood and now correctly needs stone. Fixed an issue where full water gourds could not be picked up. Fixed an issue with the Antelope Hide Poncho not showing on the proxy character when equipped. Fixed a visual glitch with the horizon where the ocean meets the sky. In the process, the position of the distant mountain ranges on the far horizon have been altered. Fixed a problem with aggressive wildlife not sensing the enemy in certain circumstances. There is now a chance to have twins when hatching a dragon egg. Good luck with that. Feeding one is difficult enough. Fixed an issue with the sound effect of fire crackling not playing. Fixed an issue with shadows of the player’s equipped armor when mounted. When choosing a female character, your first person view (when you look down and see your own body) your third person view (when riding a raft and hang glider) and the proxy character on the inventory menu all work correctly, BUT… when you mount your dragon you become male again until you dismount… This will be fixed in the next update. I’ve also encountered an issue where armor pieces on the first person character become desynced from the body. Even though this happens rarely and can be fixed by crouching and standing up again, I am working on a fix. If anyone can reproduce this glitch please let me know exactly how you do it as it will help me fix it. 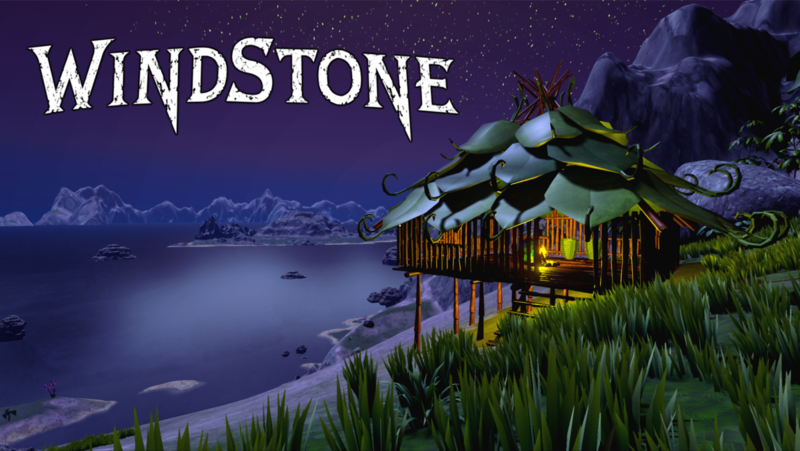 I hope to playtest and demonstrate Windstone live as well as play other games. I’ve been streaming on Twitch periodically for years, but I take long breaks to focus entirely on the development of Windstone. Now that update 18 is out I would like to take a little more time to stream and get feedback from playtesters to help guide the direction of Windstone for Update 19. Much is already planned and being worked on for update 19 but the will of the playtesters can change priorities. Check out the Road Map forum section of Windstone on itch.io to see what is in the works and to give your input on what you would like to see implemented first or worked on the most. Originally posted @ itch.io which is also where you can get the game! It has been a little longer than expected for the wait for update 18. After completing what I first had in mind for update 18 I decided to undertake the first steps into a huge optimization process, Streaming Levels. Up until now the world of Windstone and everything that it encompasses belonged to one ginourmous “level”. This is the main reason why RAM usage has been so high. No matter where you were in the world, everything was loaded into memory, from things just out of render range in your area to trees, rocks and loot on the complete opposite side of the map. This was a starting point to keep the entire world seamless, a rule I’ve wanted to stick to from the beginning since I don’t enjoy loading screens any more than you. This is why I have not and most likely will not ever even implement any loading bars for things like crafting. The closest I have come is waiting for your thirst meter to replenish when drinking actively from a water source, but that feels natural to me. Staring at a loading icon during a game for something as simple as eating or crafting a tool, especially when you cannot do anything else while it is happening, and especially when it is frequent is something that I am surprised so many players accept as normal. The answer to this is Level Streaming, the Unreal 4 Engine’s way to make large open worlds like ARK seamless. The simple definition of level streaming is that instead of waiting for a loading screen when entering new areas, only what is within the player’s view is loaded into the game and as the player moves throughout the world, new areas are loaded in and areas that you are no longer in are loaded out, so much less of the game world is loaded into RAM at any given time. When optimized well the player doesn’t even know this is happening. I’m happy to say that I have finally implemented the first iteration of level streaming into Windstone and it is relatively stable. I’m not going to say “it just works” because it hasn’t been extensively tested yet, but it’s stable on my end. The world is now divided into 25 sections that load and unload automatically while you traverse the map. For the most part, the player will not even notice this change except for the lower RAM usage if they keep an eye on their Windows Task Manager. If the player is flying a dragon high in the sky, some pop-in of trees and rocks may be noticed in the distance and some areas with more stuff in them may cause the game to stall for a few frames as the streaming level is loaded or unloaded. This can all be optimized now that the system is in place after further testing to ensure the system I have implemented is as stable as I think it is. The level streaming system also needed extensive changes to the save game system, so all 25 streamed levels are exactly how you left them when you turn off the game and resume from a loaded saved. This is also implemented and seemingly stable. After more testing, I will optimize the level streaming system even more as there is still much room for improvement. About 65% of the assets are currently included in the level streaming (so only about 35% of the world is loaded into RAM) but this can be increased into the high 90% so only a few percent of what was previously loaded into RAM before I implemented the level streaming system will be necessary. A few other minor additions including a couple NPCs that cannot yet be interacted with but are the first step in the NPC system. These NPCs currently just stand in one spot and have a “idle” animation. In the near future they will give quests with text dialogue like old school rpg quest givers. This will be expanded on in the future to included NPCs that will attack hostile wildlife in range and companions that will follow you and help fight. This is a priority, but small steps first. Thanks for your patience and thanks for playing Windstone!